It’s been years since I last stayed in a Tune Hotel. My first Tune was at Penang, during my 30-day Southeast Asian backpacking trip in 2009, the second during my Indonesia trip in 2010. Tune Hotel has expanded rapidly since then, finally making its way to Philippines shores in 2011. This February, they opened the doors of their eight hotel in the country: Tune Hotel Ortigas. I received an invite to the inauguration, and thanks to a last-minute booking in the area, I was able to check out the rooms of Tune Hotel. It was like being transported back to my rooms in Penang and Bali. There were slight differences, I realize that now looking at the pictures, but when I was there, I felt that it was exactly like the room I stayed at before. The super awesome Tune Hotel bed is of course, present, coupled with the really nice bed covers and duvet. The foldout table was there, as was the clothes bar. Even the toilet had the same look and feel. The rooms in Ortigas is bigger than the ones I’ve stayed at in Penang and Bali, and it even has a TV! 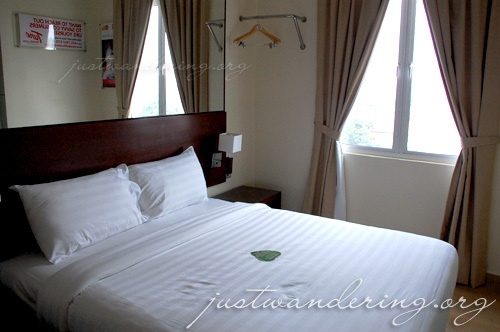 Tune Hotel Ortigas is nicely located right along Shaw Boulevard in Mandaluyong City. It’s a comfortable walking distance to Shangri-La Mall (there are jeeps right outside, if you don’t want to walk), Shaw Boulevard MRT Station, and if you haven’t melted from the heat or died from the humidity yet, SM Megamall. And if you’re adamant about not taking a cab, you can even walk all the way to the corner of Exchange Road and Meralco Avenue. Tried the Tune Hotels in Cebu and it’s actually quite nice because the basic amenities are there and it’s CLEAN! My only Tune Hotel experience was in Kuala Lumpur. Their rooms were clean, but a bit small, like the one in Penang. ..dumadami na Tunes sa Pilipinas, especially sa Manila..marami ng cheaper options. How about Go Hotels Ortigas? Should I choose them or try tune hotel? I have not stayed at any Go Hotel, so I can’t really say. It would depend on your itinerary. If you have meetings and appointments in Ortigas Center or the nearby areas, Tune would be a better choice. Win a round trip ticket to Japan on Cebu Pacific!